The benefits of lifelong learning are well documented. Many people have found solace in continuing to learn beyond their school years and are reaping the benefits both personally and professionally. I know from my personal experience that keeping my mind active and expanding my sphere of reference through lifelong learning has been hugely influential in helping me maintain balance in my life. Following on from my popular post on the mental health benefits of blogging and journaling, now I want to share with you the mental health benefits of lifelong learning. What’s that image? This week’s feature image represents Eygpt and more specifically The Ancient Library of Alexandria – one of the world’s first centers for lifelong learning. Though not actually located in the same place as the legendary pyramids pictured here, not a bad place to study. Don’t just take it from me – trust the experts! I have summarised 5 of the most significant benefits of lifelong learning identified by experts in the space for you below. Probably the most widely known benefit of lifelong learning is its work in maintaining a healthy brain. In Marjan Laal’s paper summarising the known benefits of lifelong learning, they cite the benefits of learning on brain health and how people with more education are less likely to have dementia in old age. “Sometimes it’s difficult looking back on our lives,” says Nordstrom. “But lifelong learning gives us the benefit of real perspective and enables us to find true meaning in the hills and valleys of our past.” – A quote from Nancy Merz Norstrom. When my partner Cameron started to learn I saw first hand how much more motivated he was – it was infectious. When you are able to learn new skills and show yourself that you can implement them, it helps you be more confident. Naturally, you have higher self-esteem as you feel reassured in your own abilities. According to Nancy Merz Nordstrom on Selfgrowth.com, people who practice lifelong learning are better able to deal with change in their lives. In this modern world where the only constant seems to be change, this is a great skill to have. When you are learning it sparks discussion and presents you with multiple opportunities to interact more with people who are also learning. The benefits of having these frequent and engaging social activities have been correlated to increasing length of life. As if the mental health benefits weren’t enough another great benefit of lifelong learning is that improves your job prospects and career opportunities. Nothing! That’s what I thought – I think it’s time to start learning something new. It’s never been easier to get started with lifelong learning than it is today. There are many different options out there that you can adapt to suit your learning style as well as your lifestyle. The most familiar way to most people to learn new skills. It’s easy to find out what’s available in your area. You can search online or local notification points to find out more about the courses people are running. Then you just need to choose one and sign up! Can’t find anything you like running in person in your local area? Fear not! In this technology led world, there are plenty of online courses for you to choose from. Platforms like Coursera, edX, Udemy, YouTube, SkillShare and Udacity you are spoilt for choice! Whatever you’re interested in, you can guarantee there’s a resource out there for you to learn more. Meetups are an excellent opportunity to go, listen to a presentation on a topic that interests you from an expert and then talk about it with others. This is a fantastic, social way to expand your mind with others. Though never-ending nights in front of the TV may not feel like the best way of learning, documentaries are an exception. There are plenty of great documentaries out there on all sorts of topics. These are a great option if you’re wanting to relax and learn about something new. I’m sure I don’t need to go into detail here. Reading a book is a great way to learn more about a topic. It’s also one of my personal favorites for when I want to get deep into a subject. One resource I know I am starting to take advantage of more and more often is forums. Reddit is a great place to find like-minded individuals with whom you can have a great discussion on a topic. You can also use Quora if you have questions you want answers too or just to see different people’s opinions. Join the family to get your hands on the awesome resource booklet and we’ll also give you 10% when you make a purchase in our store. 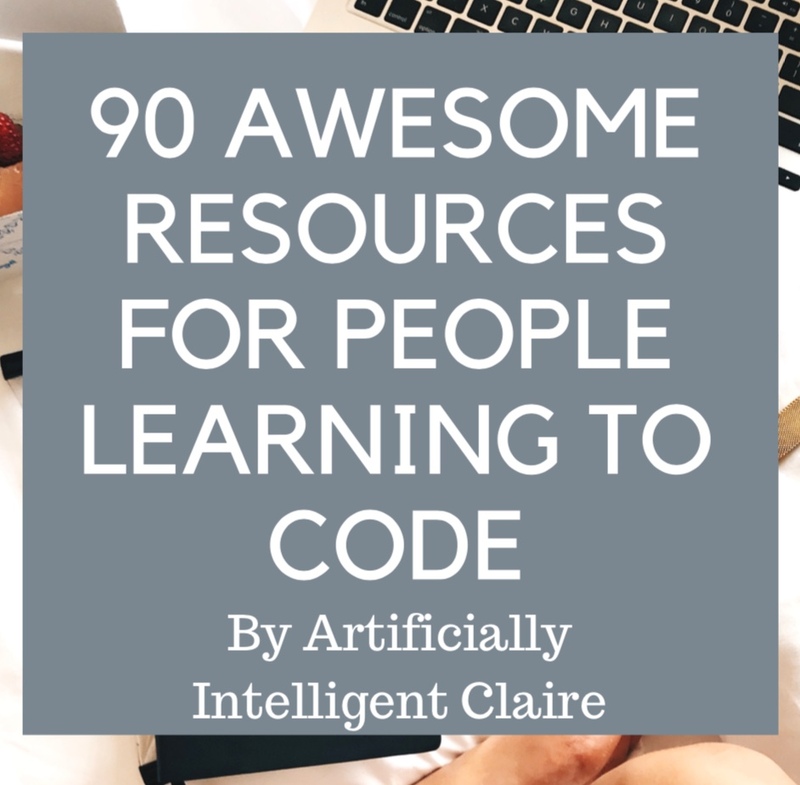 By clicking to subscribe you are agreeing to the terms and conditions and agree to be added to Artificially Intelligent Claire’s email list. How am I applying lifelong learning? Regular readers will know that I am teaching myself to code machine learning algorithms. I have found a combination of multiple of the different methods above to be the most effective. It also helps when I am bored or frustrated with one! I can attest to the fact I have seen the difference in my ability to process information and think outside the box. But more than that, I am more motivated and have the confidence to be more present in my everyday life than ever before. Where are you most excited to start applying the benefits of lifelong learning? Let’s keep the conversation going – join the Artificially Intelligent family by subscribing below and let’s get discussing! Previous Post How Will Artificial Intelligence Influence Mainstream Modern Art?